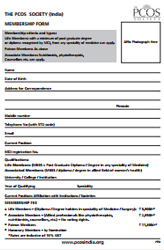 The cheque should be drawn in favour of "The PCOS Society"
FILL THE ATTACHED FORM ALONG WITH A COPY OF YOUR QUALIFICATION CERTIFICATES ( MD / DGO / DNB / MS / MRCOG OR EQUIVALENT IN OTHER BRANCHES ). All types of membership are valid for lifetime. As Patrons you get a chance to participate in the various events hosted by the society. Their names are announced along with their photographs in the quarterly newsletter, Pandora. and on the PCOS Society website. Discounts for the various programmes organised by the society. Only names are announced in the quarterly newsletter, Pandora. and on the society website.